I neither believe or not believe in ghosts. But ghost stories creep me out. My brother used to try to tell them to me to see my reactions and they'd give me nightmares. Scary movies do the same thing. I'm such a little girl about these things, but I'm still attracted to them. I like a good ghost story now and then. I like being scared sometimes. Atmosphere is key. The last time I watched Poltergeist it was a windy night, black as anything, no one in my creepy house but me and my blanket. I can't think about the movie without shuddering. And this is the season for scary things. Queen Elizabeth I haunt the Royal Library and is said to have been seen by several members of the Royal family. The sounds of her high heels are heard on bare floorboards, before her imposing figure appears and passes through the library and into an inner room. She has also been seen standing at the window in the Dean's Cloister. She is always dressed in a black gown with a black lace shawl draped over her shoulders. There's loads more, if you click on the link. 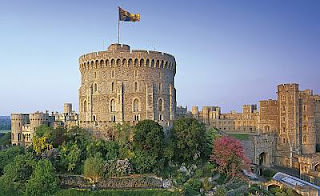 I wish Windsor Castle would do something to play on the ghostly aspect and do some event, but I'd still like to visit. So how about you? Do you believe in ghosts? Would you stay in a haunted inn? Do you like ghost stories? Do you get creeped out by them? The video below is of the Fright Night mazes at Thorpe Park. It sounds amazing. I'm not sure I'd have the guts! Would you? ohh you're too funny. we're exactly the same when it comes to the scary stuff except that i won't even entertain the idea of watching a scary movie. the last one i saw was "scream". yes, it's been that long. but if i watch it, i obsess over it and i am scared for weeks! and i can't shower with my eyes closed! anyway, i am also attracted to it in some strange way. have fun this halloween! wooooooooooooooooooo! oh, ps. have you read "Twilight" yet? Thank you, I'm sure I will have fun this Halloween, I'm just in the mood for it. And yes, I've read Twilight. At least 10 times. I was given an advanced readers copy of it when I still worked in a bookstore and when I finished it, I turned it over and read it again. I posted my ghost story just this morning on my blog! I want to say I don't believe, logically, I don't. But, well, go read my story. I'm not sure I conveyed the intenseness of what happened, but I maybe believe just a tiny bit. I LOVE ghost stories and atmospheric horror movies about the supernatural (but not monster movies like Alien or The Thing). However, I wouldn't be caught for any amoung of money in a place thought to actually be haunted. That would just be the absolute limit for me. I love halloween and ghost stories and haunted houses! I'm not sure I'd spend the night in a haunted house willingly, but I would love to visit one! Do you remember that one halloween we watched some horror movie I don't remember what it was called, but it was one of the older cheesier movies about a hand or something.. I love all things ghostly! I would love nothing more then to spend the night in a haunted house! Ha! The mere idea of ghosts FREAKS ME OUT, but I would trade off an ovary to run into Anne Boleyn floating down the hall! I believe in ghosts and such, and I lived in a haunted house/was haunted myself (I prescribe to the idea that people are haunted, not necessarily the places always). It all started when I was seven, and from then on something creepy would happen to me on a set schedule. Not fun. I enjoy that tv show Psychic Kids, airing on A&E. It makes me think I'm not alone in my experiences. I do realize I sound crazy. Very well may be crazy. That's so cool you live so close to that castle!